This is a 60-m², single-storey apartment, with 2 bedrooms. It has been recently renovated, and it is located in a quiet residential area, on a dead end. It has an outdoor terrace. 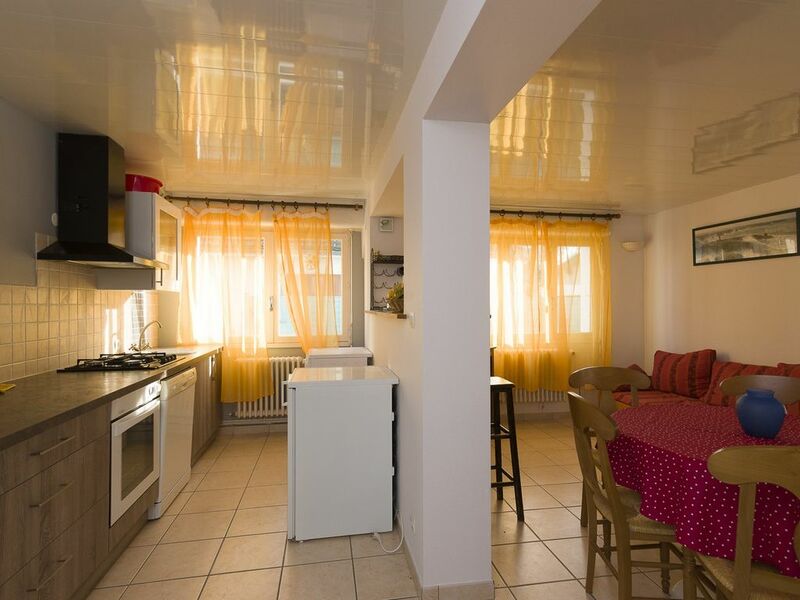 The kitchen is fully equipped with dishwasher, washing machine, a raclette set, tongs, and much more. The beds are comfortable. Vacationers were satisfied and would have stayed more time, our logbook demonstrates it! Enjoy meals outside, on the 20-m² wooden terrace! Enjoy the quiet location. Enjoy winter trips on La Baule bay and the Wild Coast, as well as many cosy evenings heated by the cast iron radiators. I am 59 years old school teacher, and author of a book on accountability. The house has a ground floor and a separate upstairs floor, with two separate entrances. It is located in a nice and quiet area, with many tourist activities near the most beautiful beach in Europe, the wild coast, fishing harbours and marina, close to the place where ocean liners are being built, and much more. It has a shower with mixing valve and two basins, with mixing valves on a sink unit. The bathroom is tiled and lit by a window. It is equipped with an electric radiator. Installation is recent (2005). Sometimes, we provide bicycles, which will allow you for moving freely on the many cycle paths and for avoiding the disadvantages of parking! You can enjoy the garden furniture and the barbecue! We provide equipment for toddlers, such as beds, pushchair, a high chair, cycles, and toys. Appartement au calme ( ppssibilite de grasse matinée)à 5 mm à pieds de la gare de Pornichet et 10 mm de la plage. Appartement classique mais tout confort wifi télévision, possibilité de stationner facilement etc. Possibilité de venir avec votre ou vos animaux de compagnie. Propriétaire discret et serviable. Bon rappport qualité / prix. Nous recommandons. Location spacieuse propre et au calme. Commodités à pied et plage à 1km. Propriétaire très discrets et attentionnés. Wir haben uns bei M. und Mme Boucher sehr wohlgefühlt: sie waren liebenswürdig, zuvorkommend und immer hilfsbereit. Die Wohnung bot alles, was man im Urlaug benötigt und war ruhig. There are many activities and visits available in the surrounding areas: Guérande, salt flats, Brière, hikes on foot, horse, bicycle, or... by car. Water sports, tennis, the wild coastline, picturesque harbours, and much more. La Baule Beach is 5 minutes away by car or bike, and 15 minutes away on foot. There are many restaurants nearby. We can provide some bicycles for discovering the many bicycle paths. The shopping centres are 5 min away. Saint-Nazaire, 10 km away, offers shopping streets and the Chantiers de l'Atlantique shipyard, where the largest ocean liners are built! The Pornichet HSR railway station is 5 minutes away on foot. The nearest restaurant is 400 m away and offers mussels, bouillabaise, crêpes, and much more. In addition, the car can be parked on one side of the house or in the quiet street. There is Wi-Fi access. We also provide baby equipment. Les séjours sont du samedi 16 h au samedi suivant 11 h, mais toutes les dérogations sont possibles en cas de disponibilités. Les tarifs s'entendent toutes charges comprises. Chèque de caution: 500€. IMPORTANT: la location se fait en principe du samedi au samedi. Pour toutes date d' arrivée différentes, merci de nous contacter. Frais de nettoyage optionel à 40 eur. Caution remboursable de 500 eur.